I am now shopping for a dress/gown to wear on the day of my wedding reception which will not be the same day as the day we official wed (date unsettled as of now but will be during late Summer) and my dress won't be white nor puffy. Since I won't be spending thousands on a gown nor a wedding, I am splurging on a designer dress and there is no budget for it so far. Ever since I decided that I won't be wearing a white wedding dress for my wedding, the first website I have stalked was Alexander McQueen. I want to marry in an Alexander McQueen dress just like Kate Middleton (minus the custom deisgn, hand-sewn lace and veil)- I chanted in my brain. Anyway, I wasn't too impressed with the gowns selection online so I thought there would be more offerings in-store. (The sales associate told me that there is in fact more things on the website. 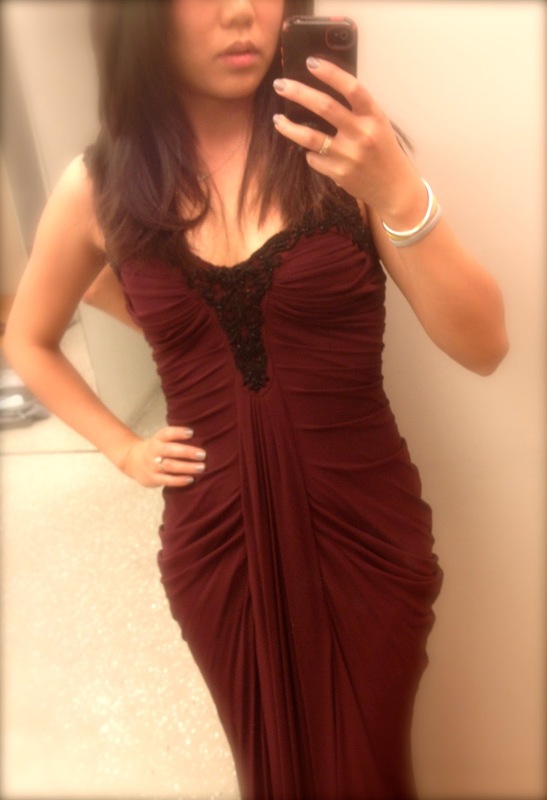 However, the dress I tried on was actually NOT on the website. I wanted to say HA! to his face but refrained myself and just glad I made it to the store and was being helped and not ignored). I went to the Alexander McQueen store in the Meatpacking district. It's only a 20 minutes subway ride away from our place so I don't know why I check it out earlier. We were actually at a gin tasting event before that and had one too many drinks. Slightly tipsy we went to shop and joked that Dave was tipsy enough to whip out his credit card to help by my dream dress at Alexander McQueen. That, fortunately for him, did not happen. 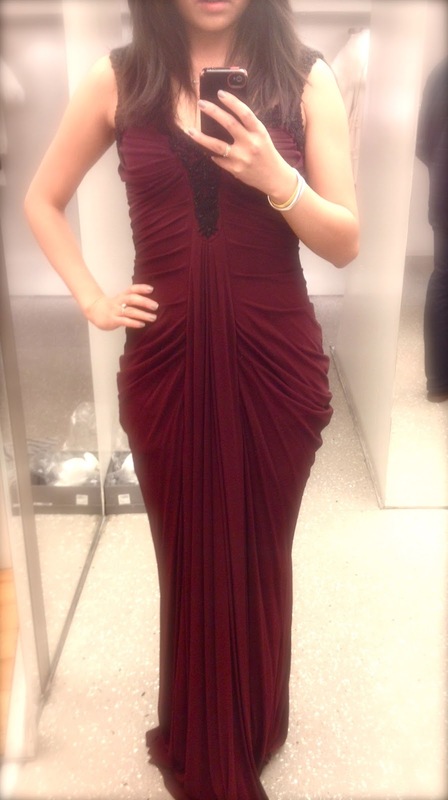 Well, seeing the dresses in person definitely is better and I decided to try on this one gown that was on sale. The other dresses, on sale or not, didn't fit what I was looking for. The dress I tried on I knew right away was too dark but it was one of the few long dresses in the store so I decided to give it a twirl. It's a drapey deep Aubergine dress and I really liked the color on me. When I put it on, it looked good. When I put on a pair of McQueen heels to give me height (gosh they are tall but comfy! ), it looked better. When the sales guy pinned me up from the back to make the dress fit me better, it looked great! When I stepped out of the fitting room and into natural light, I was a goddess (in my mind). The Grecian style dress did lack a wow factor for me but I thought it suited me really well. It flowed nicely, the material was heavy which I liked and the intricate embroidery by the collar and strap was a super nice touch! You can definitely feel the difference in quality in a luxe designer dress versus a dress from say...H&M to pick an example from the other end of the spectrum. But was it worth $4000 (or even $10,000). I don't think so. Remind you we found a beautiful $16,000 Vera Wang wedding dress sold for $3,600 at the last sample sale. Perks about this dress? It's not tight so I can eat all I want and even have a baby bump without anyone noticing! I AM NOT PREGNANT but IF I had a "bump" from over-eating or something :) during the reception, it will be barely noticeable. I like that! No diet necessary! Anyway, when I tried on the dress, the sale was on for only one more day so it was too little time for me to decide on it. Even after a 60% discount, it's still a lot of money. If it was $1000, I would maybe have gotten it. Maybe. I don't know. I just want to own a McQueen dress :) Do they have sample sales?! Hi! I think you made the right decision. The draping is beautiful, but honestly, I think it's a bit dark for a wedding dress (just my opinion). I know you said you aren't looking for a traditional gown, but you might want to check out the Bridal Garden (never been there, but they sell designer samples sold for charity). I also visited Gabriella's bridal salon in the MPD last year w/ a friend and thought they had a nice selection.